The Busy Lamp Feature (BLF) in VoIP systems is a very powerful feature and one that can save business phone users time and help connect your customers to a live person, who is available. It is also a feature that most providers support, and indeed most phone manufacturers so we recommend you continue reading as this feature could become your new business BFF (Best Friends Forever) - yes we love our acronyms. In this article we will explain the meaning of BLF and highlight some of the ways to use this special feature. The details in this guide are primarily based on Yealink IP phones but the functionality described should relate to most phones in the market. First of all, what does BLF mean we hear you say? Well the BLF meaning is as simple as the name suggests, Busy Lamp Field. In other words, it can be used as a user busy detection mechanism, where a lamp is used to show whether a specific user is busy or not. The fact that the word "lamp" is used on this acronym highlights how long this feature has been in existence. On most new phones, the lamp is typically a small Light Emitting Diode (LED) that can be lit red or green based on the state of the user's phone being detected. For higher-end phones that have larger displays and touch screen capabilities, often the BLF functionality will not actually be a physical button, but rather a touch screen button. An example of this is highlighted in the image above, where Bill and Warren are on phone calls, as signified by the red icon and the text which indicates the phones are off-hook and actually in a conversation, though not necessarily to each other. The main advantage with BLF is that one can tell if a user is busy on a call with someone and therefore you know not to bother them or transfer a call to them at this time. Busy Lamp Field being used as a call busy or user busy detection is actually only one part of this special feature. The BLF button can actually be used for multiple functions, as we will now explain. The BLF keys are great for speed dial. Simply press the button to instantly call the person's extension that is tied to your BLF key. It tends to be good practice to setup BLF keys just for those that you need to either speed dial or monitor. Setting up a key for everyone in your business may not save you time in the long run as you will be scrambling to find the person. 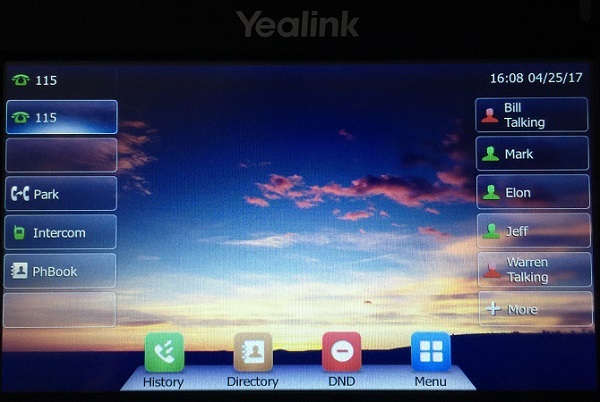 For example, the Yealink T48S can be configured with up to 29 DSS BLF keys. This sounds great but will likely clutter your display. As a side note DSS stands for Direct Station Selection and is the name used for the programmable keys you can configure on your IP phone. BLF call pickup is very convenient for a receptionist or for specific groups in a business, for example your sales team. If a call comes in for a colleague and they are not answering or away from their desk, you can perform a call pickup and answer the call for them. To do this, simply press the BLF key when you can see that the user's phone is ringing (the key will show as red and ringing) and you will answer the call on their behalf. Some phones, such as the Yealink devices, can also be programmed to provide an audio and/or visual alert when an incoming call arrives for a user on one of your BLF DSS keys. If you answer a call and need to transfer it to someone that is setup as a BLF key on your phone, simply press the key and it will automatically transfer the call to them, usually either as a blind or attended transfer. Check to see their status first using the Busy Lamp Field as they may already be on a call and if call waiting is not enabled, your transfer will likely go straight to their voicemail greeting. Parking a phone call is useful if you need to pickup a call from another phone location. By using call park in conjunction with BLF, this task becomes much easier. You could configure a few parking slots for this purpose and the Busy Lamp Field can be lit to signify which parking slots are in use. An example here would be a receptionist parking a call and announcing the call over the office intercom, such as "Call for Jim parked on line 3". When you go to another phone that has parking BLF keys, line 3 will be illuminated and pressing it will pickup the parked call. BLF call list groups can be a useful feature when your phone has a minimal set of buttons and a smaller non-touch display. The phone can be configured to monitor a list of extensions and the BLF key will light if any of them in the group are in use. Often this feature will work in conjunction with the display so it can highlight the extension(s) that are in use on the display. In this article we explained the BLF meaning and gave a number of use cases for the Busy Lamp Fields. By carefully configuring a phone for your specific needs, the BLF keys can be a valuable productivity enhancement if you spend a lot of time on your phone at work. If you have any comments or have questions, ask away using the form below. We are happy to help.